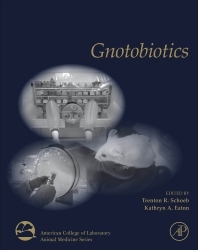 Gnotobiotics summarizes and analyzes the research conducted on the use of gnotobiotes, providing detailed information regarding actual facility operation and derivation of gnotobiotic animals. In response to the development of new tools for microbiota and microbiome analysis, the increasing recognition of the various roles of microbiota in health and disease, and the consequent expanding demand for gnotobiotic animals for microbiota/microbiome related research, this volume collates the research of this expanding field into one definitive resource. Dr Trenton Schoeb’s research focuses on gnotobiotic and specific pathogen-free (SPF) rodents and the phenotyping of mutant mice. He has participated in a wide variety of projects involving evaluation of disease expression in rodents and other species. His current interests are in development of gnotobiotic mouse models of inflammatory bowel disease and identification of specific intestinal bacteria involved in initiation and/or perpetuation of intestinal inflammation in these models. Dr. Kathryn Eaton is a board-certified veterinary pathologist (diplomate of the American College of Veterinary Pathologists) with research interests in bacterial pathogens of the gastrointestinal tract, host-pathogen interactions, and intestinal immunity.